One of my favorite parts about Disney Parks is the food. One of my favorite parts about life is the food, but I digress. 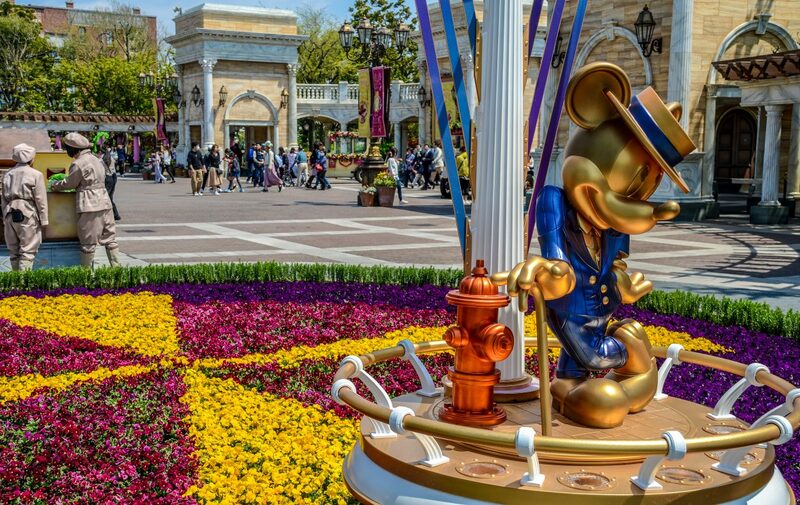 Disney Parks don’t just have the food that is typically associated with theme parks. There are a variety of choices and some, if not most, have a pretty high quality of food. 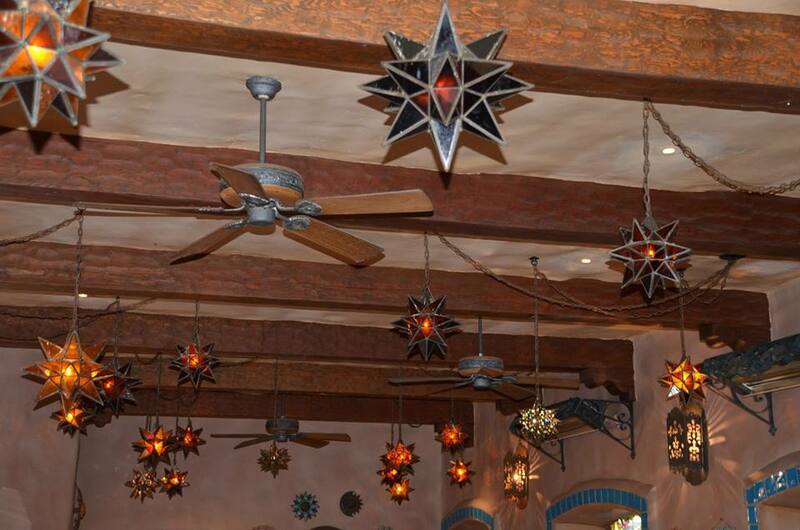 Rancho del Zocalo Restaurante in Disneyland fits that mold. In this post, I’m going to review a recent trip my wife and I had to Rancho del Zocalo. 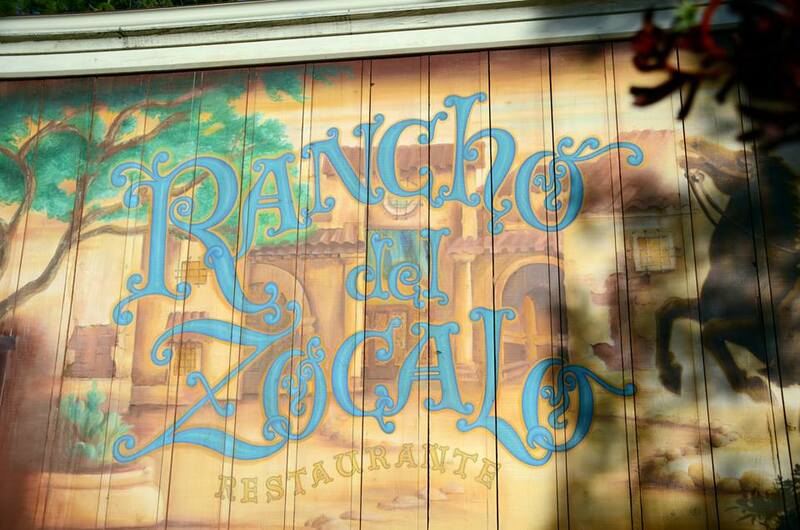 Rancho del Zocalo is a quick-service Mexican restaurant located in Frontierland. The outside of the restaurant is a Spanish style building with archways and colorful decorations. As you enter the restaurant there’s a few different signs hanging or painted on a wall. We walked into the restaurant and headed towards the counter, which was large and had most of the cast members making food behind it. They had a few items to look at, if you were having trouble making your decision. We ordered, got our food, and paid before we sat down. A quick tip! Rancho del Zocalo offers free refills (or did when we were there) on their drinks through the remainder of the day. This was very useful when we were there in the 98-degree heat. After we got our food, we headed for our seats. 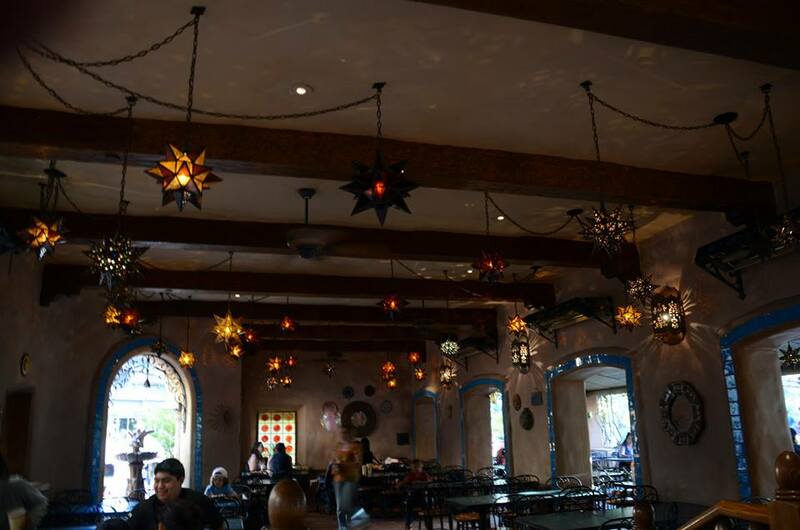 The interior of the restaurant was decorated with star lanterns and colorful tile. The decorations are festive but still fairly understated. It was very relaxing, as we were able to watch the flowing fountains outside. Now, for the food. A quick disclaimer, I’m a fairly tough judge when it comes to Mexican food. I absolutely love it and grew up in a place where authentic Mexican food was pretty easy to find. I don’t think I’m a Mexican food snob, as I still stop by Taco Bell once in a blue moon, but I do have fairly high standards. With all that being said, I enjoyed the food quite a bit. I had the carne asada and enchilada platter. As you can see, the portions are pretty large. This is currently $13.49 on their menu. The enchiladas were pretty good. They were cheese enchiladas and the sauce on top of them was a typical enchilada sauce, which isn’t a bad thing but just nothing special. The carne asada was my favorite part of the dish. It didn’t have a huge amount of flavor but it was cooked well (not to be confused with very-well done) and juicy. 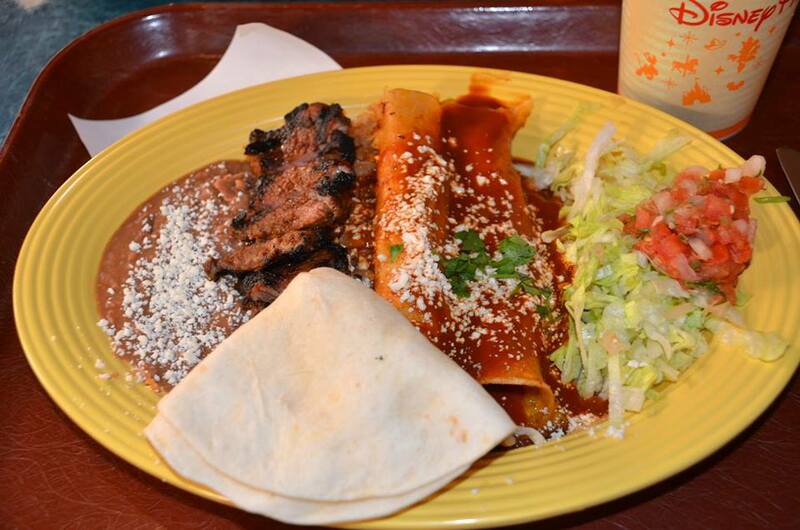 The beans and tortillas with the dish were a nice addition. The dish may not have been extremely authentic Mexican but it tasted good and was really enjoyable. It was also a pretty decent value, as far as theme park food goes. I paid around $15 dollars for the meal total (including a drink) and had more than enough food that was pretty enjoyable. I’d highly recommend the dish. 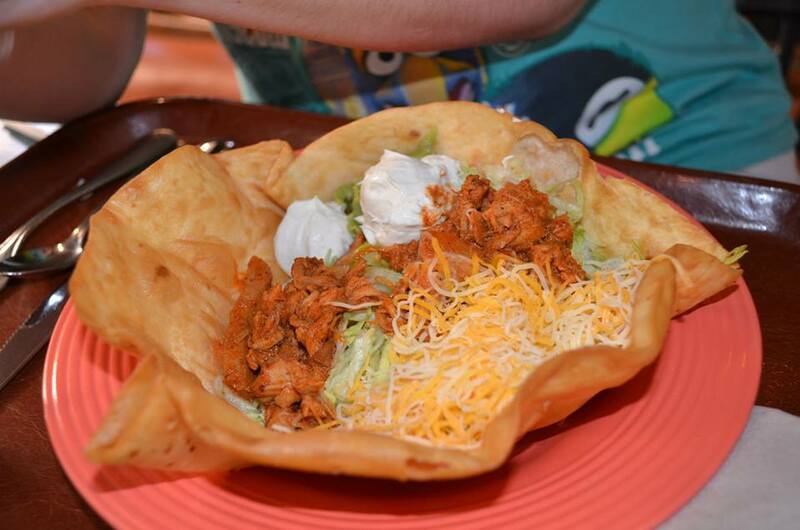 Melissa had the Taco Salad and she said she really enjoyed it. She had chicken on it, but there were several different options of meats to put on it. Here’s the menu! Most counter-service restaurants in Disneyland serve their food on real plates and with actual silverware (not the plastic stuff). 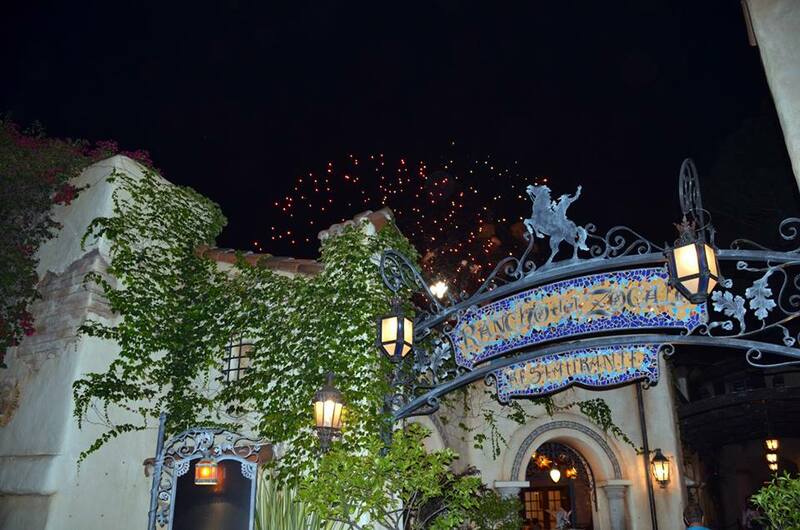 It’s a really nice touch and always adds to the intimate feeling that Disneyland has. Overall, I really enjoyed the meal. I thought the food was fresh and well-made. Sure it’s not as good as some other Mexican restaurants you could have in Southern California but for being in Disneyland, it’s pretty good. It’s one of my favorite counter-service restaurants at the Disneyland Resorts, and that’s probably saying more than it does in Disney World.